Bayonetta is an action game that follows the story of the last survivor of an ancient witch clan who keeps a balance between light, dark and chaos. The title’s main character, Bayonetta, is thus revived after five centuries to continue this struggle. With only one clue about her past, she sets out on a quest to find out who she really is, facing hordes of enemies and giant foes. Bayonetta gamers will also face various technical issues. 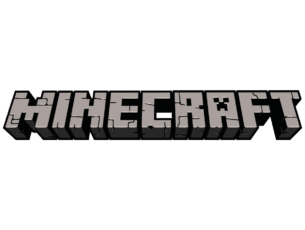 They report that the game is sometimes affected by a series of bugs that limit the gaming experience. 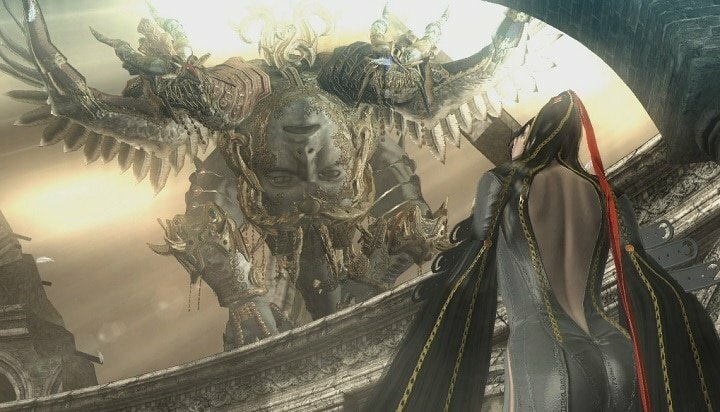 In this article, we’re going to show you how to fix common Bayonetta bugs. Bayonetta PC black screen – This is a common problem with many games, and it can be caused by your graphics drivers, so be sure to update them to the latest version. Bayonetta choppy, PC stuttering – Many users reported stuttering in Bayonetta. This can be caused by your settings, so try changing your resolution or disable Vsync. Bayonetta performance, sound issues – According to users, many have encounter performance issues. This can be caused by your graphics card drivers, so try switching to an older driver and check if that helps. Bayonetta white screen – Many users reported white screen in Bayonetta. This isn’t a serious issue, and you can fix it by running the game in Compatibility mode. Vsync is a useful feature that allows you to sync your FPS with the refresh rate of your monitor. This feature is great if you want to ensure that your game sessions are smooth and without any screen tearing. However, many users reported that Vsync actually caused FPS drop in Bayonetta. To fix this problem, disable Vsync completely. In addition to disabling Vsync, users are suggesting to run the game in Borderless Window mode, so you might want to try that as well. After making these changes, the issue should be completely resolved. According to users, sometimes running the game in Offline mode can improve your FPS. 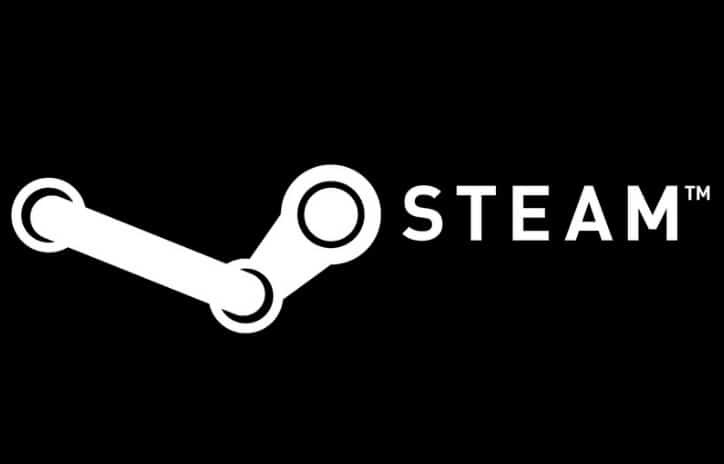 If you notice any FPS drops or stuttering, be sure to go Offline in Steam and try to start the game again. After starting the game in Offline mode, check if the problem is still there. If you have FPS issues in Bayonetta, you might be able to fix the problem by switching to a different resolution. Many users reported that switching to a 16:9 aspect ratio resolution fixed the problem for them, so be sure to try that. After switching to a 16:9 resolution, check if the problem is still there. For a better gaming experience, we recommend downloading Game Fire for free. 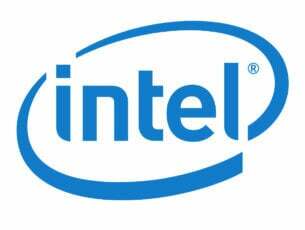 It will help with various gaming issues, such as freezes, crashes, low FPS, lags and slow PC. If you want to ensure that Bayonetta is running smoothly on your PC, it’s recommended that you keep your system up to date. 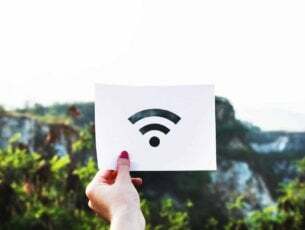 Certain glitches and issues can occur if your system is out of date, and for the most part you can fix those issues by updating your system. Now go to Update & Security section. 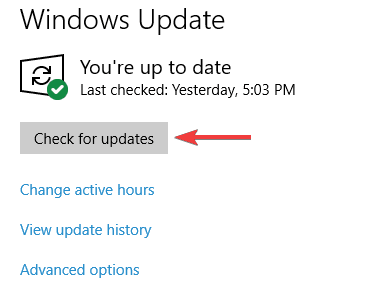 Once your system is updated, check if the issue is still there. According to users, you can fix various Bayonetta issues simply by checking your graphics card drivers. 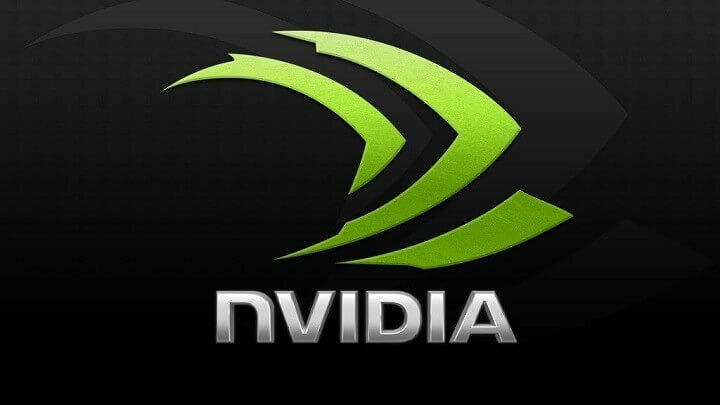 Several users claim that the latest Nvidia drivers might not work properly with Bayonetta, so you might want to uninstall them and install older drivers. Use Display Driver Uninstaller to remove your graphics card driver. Once you do that, visit your graphics card manufacturer’s website and download the driver that is at least a couple of months old. After downloading the driver, install it. After installing an older driver, check if the issue is resolved. While your PC boots, keep pressing Del of F2 button on the keyboard to enter BIOS. Now look for High Precision Event Timer option and disable it. 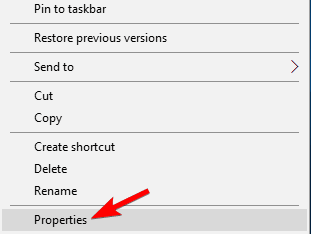 Once you disable this feature, save changes and restart your PC. After doing that, check if the problem is resolved. If you have problems entering BIOS or if you can’t find this feature, be sure to check your motherboard manual for detailed instructions. According to users, sometimes features such as HDR can interfere with Bayonetta and cause FPS drops to occur. To fix the problem, simply find and disable HDR feature and the issues should be resolved. In addition to HDR, users are suggesting to disable Steam Overlay feature, so be sure to try that as well. Like many other games, Bayonetta requires Visual C++ Redistributables in order to run. If these components are missing, you might be able to fix the problem simply by installing them manually. To do that, just go to Bayonetta’s installation directory and look for a vcredist directory. Once you open this folder, be sure to install all available files. Once the necessary components are installed, try to run the game again. Several users reported that they fixed the issue by installing the game on their system drive, so be sure to try that as well. Many users reported duplicated and picture-in-picture cutscenes in Bayonetta. This can be an annoying issue, and it’s usually caused by your resolution. This issue can appear when using 16:9 aspect ratio resolution, and to fix the problem, you just have to change the resolution to 1920×1080 or 3840×2160. Go to Bayonetta’s installation directory, locate its .exe file, right-click it and choose Properties from the menu. 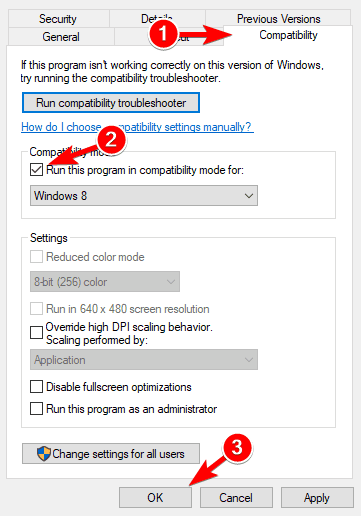 Now go to Compatibility tab and check Run this program in compatibility mode for. Select Windows 7 from the menu and click Apply and OK to save changes. After doing that, try to start the game and check if the problem is resolved. To enable 21:9 aspect ratio support, you need to use a Hex editor and edit the .exe file. More specifically, replace 39 8E E3 3F with 55 55 15 40 save the file and launch the game again. Run Bayonetta.exe or from Steam. Your gamepad/ controller should work now. Although this is not an issue per se, many players are annoyed by having to pause the game and then go to Options in order to skip the cutscenes. On an Xbox controller, you can simply use the back+RB combo to quickly skip the cutscenes. We hope that the workarounds listed above have improved your Bayonetta gaming experience. If you’ve come across other quick fixes, feel free to list the troubleshooting steps in the comment section below.